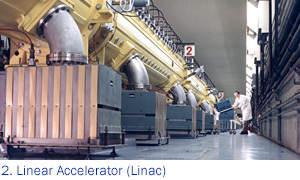 Heavy ions begin their travels in the Electron Beam Ion Source accelerator (1). The ions then travel to the small, circular Booster (3) where, with each pass, they are accelerated to higher energy. From the Booster, ions travel to the Alternating Gradient Synchrotron (4), which then injects the beams via a beamline (5) into the two rings of RHIC (6). In RHIC, the beams get a final accelerator “kick up” in energy from radio waves. Once accelerated, the ions can "orbit" inside the rings for hours. RHIC can also conduct colliding-beam experiments with polarized protons. These are first accelerated in the Linac (2), and further in the Booster (3), AGS (4), and RHIC (6). EBIS is a compact source and heavy ion accelerator that serves as the start of the pre-injector system for RHIC and the NASA Space Radiation Laboratory (NSRL). 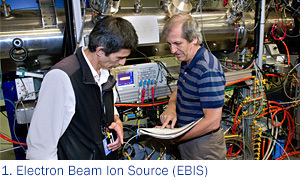 EBIS can create highly charged ion beams from almost any element. These ion beams are then accelerated by two small linear accelerators and carried to the Booster. EBIS can feed beams of different ions to RHIC and NSRL at practically the same time, and also quickly switch between different ion species. 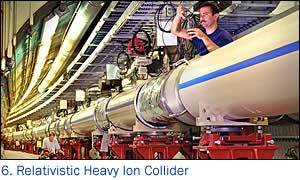 In addition to heavy ions, some experiments at RHIC use colliding beams of protons. For these experiments, energetic protons are supplied by the 200-million electron volt (MeV) Linac. Protons from the Linac are transferred to the Booster. The Booster synchrotron is a powerful circular accelerator that provides the ions more energy, by having them “surf ride” on the downhill slope of radio frequency electromagnetic waves. The ions are propelled forward at higher and higher speeds, getting closer and closer to the speed of light. The Booster then feeds the beam into the Alternating Gradient Synchrotron. 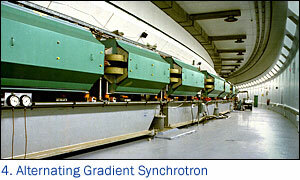 As ions enter the Alternating Gradient Synchrotron (AGS) from the Booster, they are traveling at about 37% the speed of light. As they whirl around the AGS and are accelerated as in the Booster, the ions get even more energy -- until they are traveling at 99.7% the speed of light. Light travels at 186,000 miles per second, the natural speed limit in the universe. Einstein created his theory of special relativity to describe the bizarre behavior of objects traveling this fast. Hence, the "relativistic" part of RHIC's name. When the ion beam is traveling at top speed in the AGS, it is taken down another beam line called the AGS-to-RHIC (AtR) transfer line. At the end of this line, there is a “fork in the road”, where a switching magnet sends the ion bunches down one of two beam lines. Bunches are directed either left to the clockwise RHIC ring or right to travel counter-clockwise in the second RHIC ring. From here on, the counter-rotating beams are accelerated, as in the Booster and AGS, and then circulate in RHIC where they will be collided into one another at as many as six interaction points. RHIC's 2.4 mile ring has six intersection points where its two rings of accelerating magnets cross, allowing the particle beams to collide. The collisions produce the fleeting signals that, when captured by one of RHIC's experimental detectors, provide physicists with information about the most fundamental workings of nature.